Food served Wed/Thu 5.30–9.30pm; Fri/Sat noon–2.30pm, 5.30–9pm; Sun noon–5pm. Closed Mon/Tue. Clever cooking with a conscience at competitive prices, with a heavy reliance on locally sourced produce. Borough is all about competitively priced, accomplished cooking with a conscience. 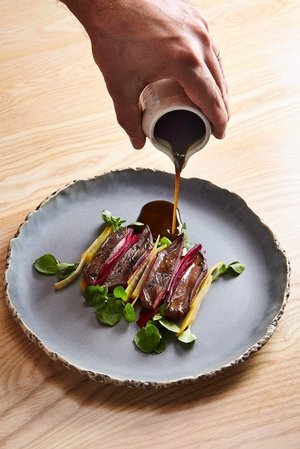 It’s a well thought-out venture driven by amiable chef-proprietor Darren Murray – a man with an impressive CV – and restaurant manager Aleksandra Murray. Championing ethical sourcing, careful recycling of waste and supporting local charities. This cosy neighbourhood spot is pitched at the Leith market and fits neatly between the Michelin-starred glitz nearby and more basic options. The availability of ingredients defines the ever-changing menu – what’s bought that day will be transformed into well-presented dishes. There are limited options at lunchtime and no choice for the four-course evening menu offering one veggie, one fish, one meat and dessert. That might mean a clever combination of squash, carrot and crowdie followed by hake with cauliflower and blood orange dressing, then a perfectly cooked lamb loin served with meatballs made from lamb offal. It’s rounded off with a dessert featuring a twist on traditional flavours – for example, set chocolate cream, barley and mint granita. There’s also an interesting wine list, or BYO on Wednesdays and Thursdays.